Sunday afternoon felt like the perfect time to make chili, so I did. I've been using pretty much the same recipe since last winter and thought I'd share...it is so easy to prepare (and make substitutions), and the flavor is sweet and tangy. Just be careful not to get carried away with adding the chipotle in adobo (I had to give an entire batch to my brother last Christmas because my mouth was on. fire!). Heat olive oil over medium heat in a medium pot, adding in the carrot, onion, red pepper, garlic and spices. Cook, stirring, for 15 minutes or until softened. Add in the chipotle and stir to combine. Turn the heat up to high, add the tomatoes with their juices, crushing with a wooden spoon (I also use a masher to make things even smoother); bring to a boil. Reduce the heat to low and simmer for 40 minutes. Add the beans, filling one 14oz can with water and adding to the pot along with the salt. Bring to boil, and simmer again for 40 minutes on low. Add in the tomato paste (and optional meat), cooking for 20 minutes or until flavors are combined. Add optional toppings and serve. There are so many good recipes drifting around the internet these days for fall cooking, and this is one of them. (Not sure my biscotti recipe I shared on my blog today counts, but it's delicious too, I guess!) Can't wait to try this recipe when we're back in chilly Sicily for the winter. My husband will love it; this is totally his kind of meal. Oh yum! 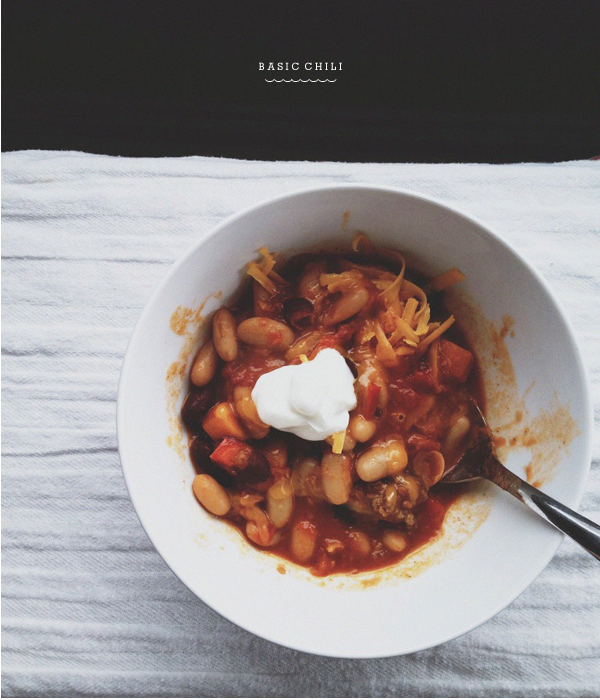 Definitely bookmarking this - a big pot of chili in the fall can't be beat! As soon as fall rolls around I start craving chili -- I'm going to have to try this one. ooooh, great recipe for the weekend, thank you! i also love to add some beer to it. The smell and flavor is awesome. it is so chilly here right now that just seeing this kind of warms me up! now someone just needs to make it for me! this looks so yummy. vegetarian chili is one of my favorite fall dishes, there's nothing better on a crisp night!